Honey hunting is one of the many activities that form part of the ancient culture of numerous civilizations. Scientists have estimated through rock painting documentation that honey hunting was practiced as far back as 13 000 BC. In Nepal, honey hunting has been practiced for thousands of years and is a vital part of the Nepali culture. Some villagers in Nepal depend on honey hunting for their livelihood, and the country is home to the Apis laboriosa, which is the biggest honeybee on the planet. These bees construct their hives on the cliffs of the country’s foothills, and watching the honey hunters at work is a sight to be seen. 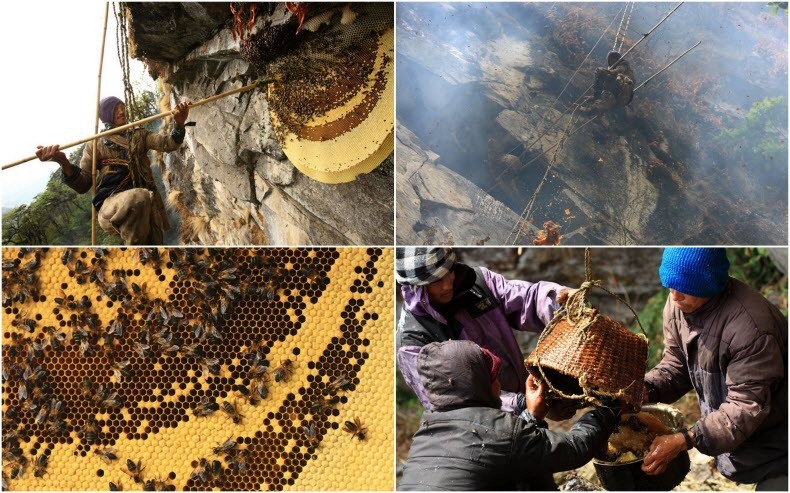 Due to the location of the bee hives, honey hunters make use of rope ladders and baskets to get to the combs after the bees have been flushed out with smoke by lighting a fire underneath the hives. Honey harvesting usually takes place twice a year, when honey hunters get together and head into the Himalayas to take on this massive task. To harvest one colony takes the honey hunters two to three hours depending on the location of the hive and its size.